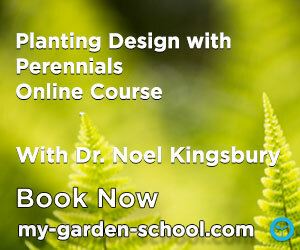 Noel's Garden Blog: Gardening in straight Lines? Various ramblings and musings on gardening, agriculture, food and related subjects. We moved two years ago. And of course quite a bit of the last garden came with us. Courtesy of a friend who was a National Trust head gardener at the time, who thought that helping me dig up the last garden (rendering the place into a passable imitation of a First World War battlefield in the process) would be a good ‘training exercise’ for her staff. (Thanks Deb!). At the new place everything just came out of the back of the van and got planted in straight lines – individuals of a variety together but otherwise randome. And it was quite remarkable how at the end of the summer, when a lot of things were in flower, just how many people said to us ‘Oh what a lovely border’, as if it had actually been designed – it makes you think about whether there is any point in designing anything. Perhaps the key point was the plant selection worked together – a result of my plant choice over the years – largely an unconscious process, and NOT the actual putting together of the plants. It reminds me of the number of people who have said to me, or published in articles, that they love Piet Oudolf’s stock beds – which are a more or less random collection of plants. I am sure Piet laid them down with at least a subconsicous pattern, or intention. But the important point is that placing does not actually matter that much - sorry designers!! Plant selection is perhaps more important. Ok – the straight lines look kinda naff first thing in the year, when you can see them. I mean, nobody actually likes plants in straight lines really do they – apart from cabbages; forestry plantations are derided because they are in straight lines, its fine to put hedges in straight lines, but definitely not herbaceous. Apart from those rather awful ranks of perennials at the 2005 BUGA in Munich. Mix them up a bit though and after a couple of months growth you don’t even notice they are in lines, at least until you are right on top of the line. There is a huge practical advantage for weed control – you can just hoe off anything that comes up between the rows – like in a field of crops. In terms of keeping an eye on what is happening it is useful too. I am interested in how perennials spread, seed, and move within the border. It is difficult to appreciate this in a ‘normal’ border, but if everything starts off in a line, then it is possible to see when things start to move, or start producing seedlings. Could be a good research tool. So, for now, the straight lines are staying into their second season – re-arranged and partly randomised, some things taken out and put elsewhere. And from now I hope that we will start to get some self-sowing between the lines, and an increasing level of blurring. Once the plants you want, start to self-sow, then there is competition for weed seedlings and we start to move into the creation of an artificial eco-system, ultimately what I had in the last garden – which is an almost continuous vegetation canopy – very low maintenance and distinctly naturalistic in effect. Planting in straight lines then is not a commitment to continuing to do so, but a good starting point, a pragmatic beginnning. You can see my recent lecture at Hauser + Wirth about Piet here. 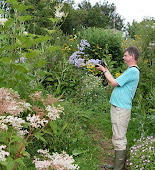 Pictures of the garden through the year are now available here. Its all in the mix..... resources for understanding Mixed Planting. Ecological Planting - The revolution will never be bought at the garden centre. Beyond 'nature as virgin – garden as whore'. The most exciting garden in Europe: Hermannshof. And the most beautiful, Le Jardin de Berchigranges. In England I'd flag up Holbrook Gardens in Scotland: Cambo. Favourite nurseries are Crug Farm, Cotswold Garden Flowers, in Austria Sarastro and Ewald Hugin in Germany. Photographer Andrea Jones is someone I much admire. Piet Oudolf is deservedly regarded as probably the best garden designer in the world. At the University of Sheffield, James Hitchmough 's work is revolutionary and full of enormous potential; Nigel Dunnett at Sheffield is a green roof, rain garden and sustainable planting guru. Over in the USA Tracy DiSabato Aust is a gardener of skill and originality. In Uruguay, Amalia Robredo is doing very good work. Of garden websites check out Thinking Gardens for something completely thought-provokingly different, though 'tis a bit like the sea - there are deep bits and shallow bits. Finally, a friend, Jonathan Garratt - he's a potter, but with a good understanding of gardens and an acerbic commentator on the British gardening scene. At home in the wild garden. 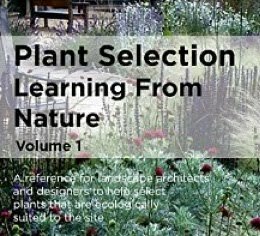 Gathering Gardeners' Knowledge from the Hardy Plant and if you want more detail try this from The Plantsman and if you want the full report try this. This blog is a place for observations, thoughts and opinions that occur to me as a gardener, horticultural journalist, researcher and commentator on the garden and landscape scene. And sometimes on the food and agriculture scene too.... when, you should be warned, I sometimes express unfashionable thoughts. I am now publishing e-books through Amazon, for Kindle, smartphones, iPads etc. There are currently three available, two based on collections of writings for Hortus magazine, from the early 2000s, and one which is an interview with Beth Chatto. Click here for Amazon North America or Amazon UK. Lesen Sie einen Artikel über mich durch Kölnverfasser Ina Sperl - Die Neue Ästhetik Und ein Befragung mit der Gesellschaft Schweizer Staudenfreunde Hier können Sie über meinen Garten der Zukunft lesen. In February I went to Switzerland to do a lecture for the Swiss Hardy Plant Society (rather quaintly called the Swiss Friends of Perennial Plants). Here is the original English version of an interview he did with me. (you can see German and French above). Merci à Xavier Allemann. Let’s face it, we all love a good row.